Lansdowne Living is a collection of fictional characters that could live on Lansdowne Avenue in Toronto. Although it is an area gradually being gentrified, it retains much of its interesting and grungy, rough around the edges past. As a result, you see quite a range of colourful characters that still call the area home. I work in this Lansdowne neighborhood, and often, as I pass such individuals; I imagine what sorts of stories they may tell in their day and about their lives. 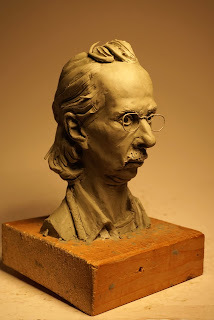 As a video game character artist using digital media in my job, I really enjoy working with the oil-based chavant clay. It allows me to get back to working with my hands, and to be immersed in the immediate physical and tactile experience required to sculpt these models.